When I saw Picasso’s Stalin for the first time I was disappointed and confused – I lived in Russia for almost half of my life, and took Stalin’s abominable crimes against humanity and exceptional monstrosity of his personality very close to my heart. I didn’t find in Picasso’s representation of Stalin the depiction of his monumental evilness, and was perplexed by how an artist with such a penetrating power of vision could miss it. I felt that Picasso almost normalized Stalin, reduced him to universal peasant simplicity, the impression reinforced in me by the fact that the drawing was a reaction on Stalin’s death, as if a despot can become less inhuman after his death. Only step by step I started to grasp Picasso’s idea of Stalin – moral monstrosity is not something exceptional to human nature and to human beings. It is enough to be rude and instinctive, to perceive the world as a place of fight, not to be emotionally warmed up by the disinterested contact with other human beings, to have ambitious and rivaling predisposition, and not to be educated – to be prone to behave indifferently, hatefully and destructively. It is enough, like Stalin, not to be nurtured by the serious art, and to be a believer in power over life and other people – to become a relaxed lout and brute, and a silent murderer. We see Picasso’s Stalin as a creature with simplistic facial features. He takes aim at the world with his right eye, and he kills it with his left. His gaze is without any contemplation or meditation, not even any concentration. It is just the hardness of confrontation, not even aggressive or hateful (it will come with the circumstances), the position of being a competitor against what or whom he sees. His eyes are like armor. His eyebrows are like wings of a big predatory bird. His mustache is like a chewing. His hair is like barbed-wire. He looks at the world with one determination – to squeeze it under the boot, with one desire – to find out who will beat whom: he – his rivals and opponents or they – him. He doesn’t look too thuggish only because he is not overweight – like some on American streets today in whom extra-fat becomes an additional armor reinforcing their suspicion and hate toward too many categories of people – liberals, intellectuals, “idealists”, minorities, union workers, everybody who personify for them otherness and dissimilarity. Picasso’s Stalin is a country guy who learned that to live is to fight, and who considers his beliefs as more important than life of other people. From the first glance, it is strange that Picasso is showing Stalin as a young man, but he, indeed, never matured: his wooden or stone-like nature never developed. People like this are deprived of development – in their old age they are as limited as they were in their twenties. Picasso’s task is to show the essence of the person, not to scapegoat or to elevate. I don’t think I could understand Picasso’s concept of Stalin if I hadn’t lived through eight years of neo-conservative rule and hadn’t seen the behavior of financial elite of decision -makers who created the financial collapse in US and fire American workers for the sake of boosting their profits. Observing so much intolerance and contempt toward compromise with those who think differently, made me grasp with clarity the similarity between people like that and Joseph Stalin (despite the fact that their banners look so differently) which Picasso helped me to notice by his portrait of the Soviet dictator of Russia. A lack of humanistic education and sophistication of the soul, the absence of culture, self-centeredness and the unconditional belief in power and control over life and world is enough to make a person extremely destructive to the life of people, societies and the whole Planet. Picasso was an ardent Communist and this almost certainly explains the cleaned-up portrait. This piece is pretty passionate and contemplative. Unfortunately, you are imprinting your own opinions into this painting. 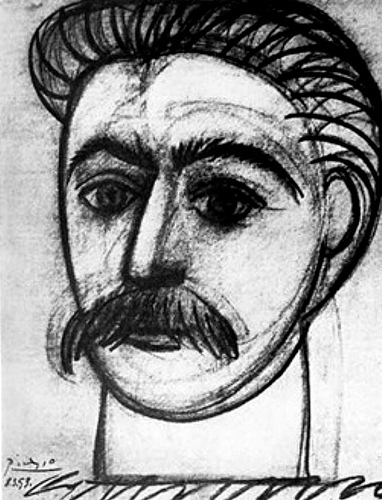 Picasso’s painted Stalin because he was a member of the communist party, which was loyal to the stalinist line. His portrait isn’t of a “silent killer”, it is a portrait of a hero of world revolution (i imagine that’s how he saw Stalin). Dude, Picasso was a communist. He probably liked Stalin. Don’t shove meaning into places where there wasn’t any intended. Pablo Picasso was a genius besides just an artist in a time when the world was at War, most of his art was based on political views, his mind never could rest, and all he could do was draw to relax himself. He protested against nuclear testing, supported women in needs – they brought him a letter and said thank. The real Pablo Picasso 1953 Stallings is encrypted with heavy information symbols and formulas which are hidden in the drawings. The drawing that you see in the newspaper is not the original drawings that Pablo Picasso did that did not look like the one that you see on the internet – there are documents to prove that there was three of these sketches, they all have a slight difference. They all carry different meanings. I hope you enjoy this small amount of information – enjoy study Picasso’s political view it’s very interesting because it’s about world events, if you enjoy history you would enjoy him like a history teacher. I was very young when I first seen my first Picasso – the real Stalin’s drawing is very moving when you find these formulas that are buried deep in the drawing. Antique roadshow experts confirm it – just look at this as a piece of Cold War and past information. Thank you for your kindness and your appreciation for letting me put this on your website.